This month marks one decade since I started SwagGrabber. This one little site has given me a full time income for 10 years. When I say full time income, I mean a good income. It has been up and down over the years but we have made a million in revenue. Yes, one million off a small site! While that sounds like a lot of money, I am in no way rich. I have employees and expenses but it has allowed me a full time income working while working at home for a few hours each day. Enough to where we can travel when we want and I get to be home for my son. For 10 years I have pretty much done everything for the site – tech, writing, social media, security, and anything else you can think of. I have learned a LOT of really weird knowledge which is why I started writing about it here on my fun site. Hopefully it can help newbies learn from my trials and errors. 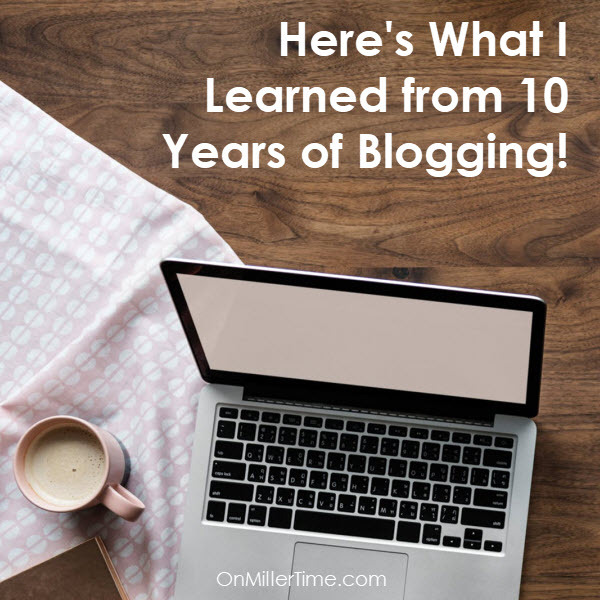 Here are the main things I have learned from my last 10 years…. For real, every site goes down occasionally. Especially when you are starting out. I would FREAK when this used to happen. I don’t any more. It happens, your readers will come back. You won’t lose a ton of money in those few minutes. Once you can afford a better hosting situation you won’t go down as much. This is one of those situations where you get what you pay for. We use WpEngine – haven’t really gone down since we switched which is awesome! This is one of the reason I started writing here. I am sick of people saying “I make $17k” my first month of blogging. No, they probably didn’t. If they do make that much a month, they are making money off people trying to learn. They are charging ridiculous fees claiming to be experts. Brand new bloggers aren’t experts. Don’t fall for it. Blogging is harder than people think. Some get lucky but for the most part it takes a while to grow a following and start making money. Traffic equals money. You need readers to start earning. Getting readers takes work so be patient. You want to build a site that will last for years – not months! I didn’t take day off for years. Yes, I worked 365 days a year for several years. Some days it was only a few minutes but some days were 20 hour days. Being attached to something like that isn’t easy and can be trying. Especially if you are relying on that income. FYI – Black Friday when working a deal site is BRUTAL! Yes, you will work a LOT in the beginning and guess what…you probably won’t make any money. This is your investment in YOUR future. Work hard and create great content and you will do well! As I just said, blogging takes work. Lots of it. If you plan to do this, make sure you are writing about something you love. SwagGrabber was fun for years, now it isn’t. Now it is work. Because of this I have streamlined the process and automated it some so we don’t have to do as much on it. Never rely on one of anything. Whether it is traffic source, income stream, or person. Always have multiples. If you rely on just one you are screwed when that one goes away. For example, we relied on Amazon affiliate income for years – LOTS of years. It was 75% off our income. They cut their commission rates in half. Guess what that did to our income? Yep, we were screwed for a few months until we figured out different income streams. Another example, we relied on Facebook for a huge portion of our traffic. They changed their algorithm and BAM a huge portion of our traffic was gone. Hence the reason I learned Pinterest lol. Basically always have backups. Don’t have one income stream, have 10! Blogging can be brutal. You are putting your heart and soul on your site and there will always be someone that will want to cut you down. Grow a thick skin quick. Don’t let the comments get to you. Just delete and move on. They really don’t matter in the grand scheme. The second you are making enough, hire help. It makes a WORLD of difference. Farm out the things you hate or aren’t really good at. Trick is finding people. Look to friends and family. My longest employee is my little sister. She is the best – been with me 8 years now! There are a lot of places you can find good writers and designers. If it isn’t your strong point, hire some! Learning how to build a site, promote a site, maintain a site can be daunting. There is a LOT to it. Read everything you can find on what you are trying to do. Reading beats experimenting any day. I spent YEARS basically just trying things out because there wasn’t a lot of help – now there is. Want to learn how to do something Google it. You will be amazed the knowledge that is out there! Don’t pay for classes right away. Most are scams and really aren’t worth the money. You can find a lot of the knowledge you need online. Here is my resource list of the best online blogging knowledge freebies. I always worked…at home, on vacation, in the car, at the park. Everywhere! I have worked on beaches, planes, cruise ships and more. If I had WIFI (which I had hotspot) I was working. This was during the height of the site when I was making a six figure income. I made great money but I paid for it. Eventually I realized I HAD to take time off and change how we did things. Before I did it all. I started relinquishing the control to my main VA/sister and started taking weekends off. Then eventually it got to where I could take a week off and feel OK about it. Geez now I could take a year off and the site would still run and make money! Now I am a firm believer in taking time off. Stepping away from the computer is hard, especially in the beginning. But it is necessary. Getting away from a site will give you clarity and help keep your sanity. Plus it can help with writers block. If you are stuck, walk away for a while. When it comes down to it, you need to know your stuff. That website is yours. Know everything about it – Google Analytics, the Hosting, DNS, Social Media. Know it all inside and out. It is yours, keep it protected. Don’t just let anyone have access to your site or you could lose everything in no time! If you have a blog, chances are it is WordPress. If it isn’t, it should be. WordPress is amazing. You can make it do just about anything you want with Plugins. There is a plugin for just about everything imaginable. Instead of learning code – learn plugins! Hope these little tid bits help you out! Got any other words of wisdom?